This week, Tim continues his discussion of sustainability in the board games industry. Where last week's article revolved around an exploration of some of the problems and inefficiencies that plague the manufacturing process of some of our favourite games, here we look ahead to some of the exciting ways that we can implement new and existing technologies in ways that can make our games lower impact, more renewable, and even more fun. This is the second of a two part series. Part 1 can be found here. Much of the focus of my post last week related to the use of plastics in the board game industry. Even though almost all game boxes and cards are made using renewable resources, many other components are not. It is with these non-renewable components that the focus should be when implementing sustainable change in the industry. Take a poll of your average board gamer, and most would probably tell you that one of the main reasons they play board games is for the social interaction. It is about having real components in front of you and interacting with a group of friends (or rivals) while playing. Some may argue that implementing more technology into a hobby that is primarily analog is a step backward for the hobby. Indeed, many of us who grew up playing video games have now shifted away from that to enjoy the tactile experience of tabletop games. And while board games will always exist in some form as a physical medium, the form that they they take can, and certainly will, change. Changing the way in which we manufacture physical components is something that can and should be implemented as soon as possible. We now have the opportunity and the capability to use other materials for manufacturing our games. All it takes is a willingness to make a change, and an acceptance that this change may come with a temporary rise in costs. It is absolutely certain that petroleum based plastics will never be cheaper than they are now, and so the earlier we invest in alternative and renewable materials (such as bioplastics), the smoother and cheaper the transition will be. There are a number of ways that we can reduce the ecological footprint that our games have, moving away from a more disposable model and into one which emphasizes long term sustainability. The most immediate and simplest way that our industry can cut back on plastic waste specifically, is to use alternative materials for crafting plastics. Bioplastics are becoming easier and cheaper to make than ever before, and the market for the production of bioplastics is increasing steadily. While the current production of bioplastics is less than 0.2% of the global polymer market, it is an industry that will only grow as petroleum becomes more expensive and exclusive. Bioplastics are not only renewable, but also biodegradable and can be made from many different materials, allowing nearly any country in the world to export materials that can be used to manufacture them. When considering bioplastics, one also has to look at the huge growth in 3D printing technology. Much of the research on 3D printing technology focuses on medical and mechanical applications, but as they become more ubiquitous they will soon reach the point where many consumers can simply print and play with their own game components made at home. In fact, many are already doing so. Industrial 3D printers have the capability of locally producing large batches of components more efficiently, and with more decentralization. Instead of having one manufacturer print hundreds of thousands of dice at one facility, which then need to be shipped all over the place, your games could be printed and assembled in a province near you, contributing to the local economy and severely reducing the amount of resources needed to produce and transport a game in the first place. This would also allow for smaller print runs and print-on-demand gaming. Never again will you need to worry about missing out on a game because it was allocated, never to be reprinted. So what about long term? Hundreds of years in the future, or even sooner, we might find ourselves playing board games very differently. 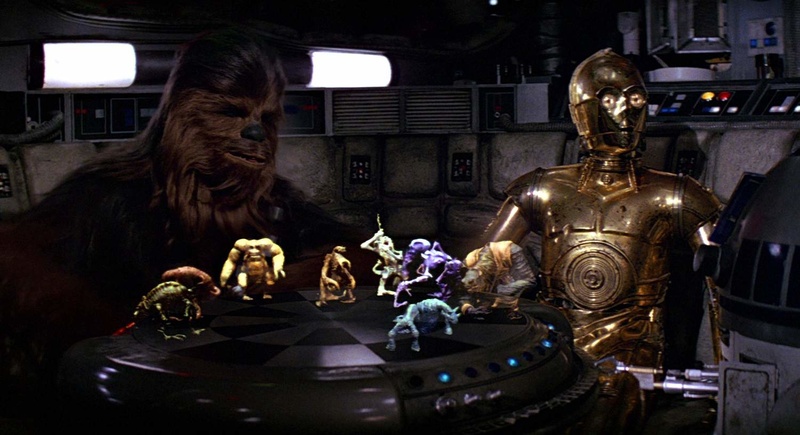 Most of us probably remember the scene form Star Wars where R2-D2 and Chewbacca play a game of holographic chess on the Millennium Falcon (Editor's Note: *nerd voice* Um, actually, it's called dejarik). That kind of gaming is not too far off. Holographic technology is here now, and while rudimentary, has the potential to change the world in profound ways. Imagine sitting down to play your favorite card game, using bioplastic cards with microchips that can project an image of the cards in your deck onto the faces. You could, conceivably, buy one deck of cards and play any game with them. Wireless charging would keep them powered indefinitely and, using a simple interface, they could be configured to play any game you want. There would be no need for shuffling, no concerns over marked cards, and you would be able have your entire collection with you anywhere you go. In addition, existing card games - such as Blizzard's hit digital card game, Hearthstone - could be ported over into an analog format. The same solution could be applied to other game components, including dice! Small LED faces could be fitted onto your dice that could be programmed with any face you want, making them usable with nearly any game. Since there are already established sizes for dice, this would be a relatively simple technology to implement. You would probably only need to buy 1 set of dice to last you a lifetime! What about for games with a board and pieces? How about a roll-up game surface that interacts with VR technology, with interactive holographic components? Being able to play a game like Santorini, using holograms, would in no way diminish the experience of the game. Some of this technology has already been implemented in a similar form via Augmented Reality games such as Lightseekers. Retail and online stores can and will adapt to this change. It is simply a matter of changing with the times. 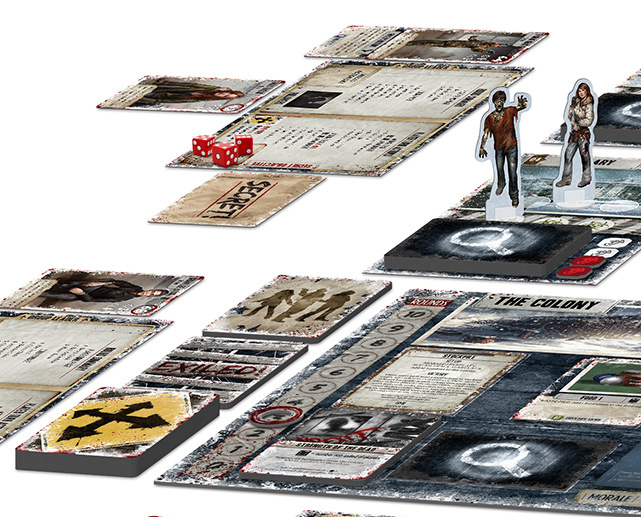 Instead of needing large storefronts or displays, digital products could be purchased and downloaded from your favorite FLGS (Friendly Local Game Store), or components could be printed right at the counter! Instead of shipping large quantities of boxes in time for streetdate, one could simply send codes out to stores. The possibilities are endless, and only limited by our imagination and drive. The reduction of physical commodities does not have to sound the deathknell for game stores or for collectors. In fact, for those that have the courage and the willingness to adapt, it could open up entirely new frontiers. By focusing on what we, as a community, ultimately want out of the board game experience, we have the opportunity to affect real change in this industry without sacrificing its core values. To some extent, this logic applies to every aspect of our lives, not just board gaming. We can consider the lessons to be learned in this hobby and use them to grow not only as gamers, but as human beings.